Ah Hawaii, land of beautiful beaches, surfing, warm weather, and unique birds. Because of its distance to the mainland, Hawaii is home to over 60 endemic avian species. Few are as unique (or rare) as the Nene, or Hawaiian Goose, Hawaii’s state bird. Nenes can only be found in Hawaii, and used to be plentiful. Before European explorers arrived in the 1770’s, this goose’s population numbered around 25,000. Less than 200 years later, there were fewer than 50 left. When Hawaii designated the Nene as the state symbol in 1957, it was uncertain if the goose would escape extinction. Nenes are attractive geese, though they were named for their soft calls rather than their looks. They probably evolved from the Canada Goose, and today sport black faces, white necks, and grayish bodies. Unlike other geese, Nenes prefer walking to swimming. Over time, the webbing in its toes has decreased, and its longer legs and shorter wings also make walking easier for this species. 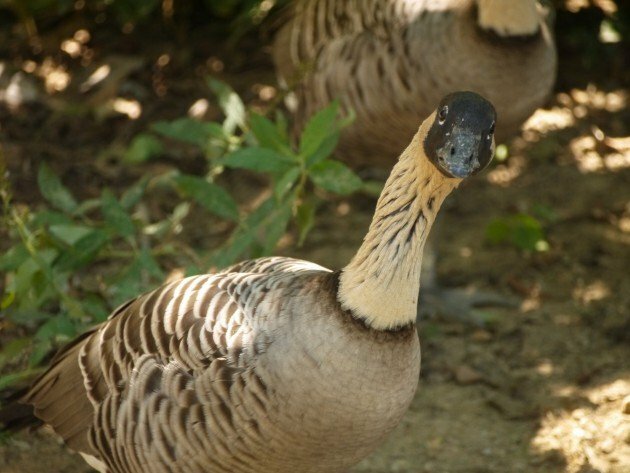 Like other geese that evolved in Hawaii but went extinct, the Nene is an herbivore. In the 1970’s, Hawai’i Volcanoes National Park embarked on an ambitious program to save the species. Captive bred geese and reintroduction went hand in hand with active population management, including predator control and habitat protection. With help, the Nene population has increased to around 2,000 individuals. Still, these geese face significant population threats. In addition to historic habitat loss and hunting, Nenes face introduced predators such as mongoose and feral cats. They are hit by cars on roadways, and face the scariest danger of all: errant golf balls on courses where they like to feed. Despite their population increases, Nenes will probably need human help to survive far into the future, and they remain the world’s rarest goose. A friend of mine has a story of searching high and low for Nene Geese in the parks, and finally finding them in a shopping center parking lot. They really need to hang out in safer places!